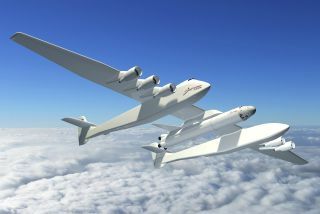 An artist's impression of the Stratolaunch Systems carrier aircraft. WASHINGTON — After the exit of launch services provider Space Exploration Technologies (SpaceX) Corp. as its rocket subcontractor, Stratolaunch Systems has turned to Orbital Sciences Corp. of Dulles, Va., to keep the world's largest air-launch-to-orbit system on track for a 2017 test flight. "We have been engaging Orbital over the past few months and have them under a study contract through early next year with specific design deliverables," Stratolaunch chief executive Gary Wentz wrote in a Nov. 28 email. "They are currently evaluating several alternative configurations that appear promising. We expect more information to be available in the February 2013 timeframe." What those configurations were, neither Stratolaunch nor Orbital would say. Huntsville, Ala.-based Stratolaunch had been banking on using a liquid-fueled booster from SpaceX. Orbital specializes in solid-fueled rockets. The first stage of the liquid-fueled Taurus 2 rocket Orbital expects to debut in 2013 relies on a Ukranian-supplied first stage powered by a rebadged Russian engine. While the company has extensive experience with air-launched systems, it has not built one with the payload-carrying capacity that Stratolaunch seeks. Orbital's solid-fueled Pegasus rocket, which can loft 450 kilograms to low Earth orbit, has logged 41 launches since 1990. Only three of these were failures, according to an online mission history maintained by Orbital. However, Pegasus-class business has all but dried up. The single Pegasus XL launch of 2012 was the rocket's first flight in four years, and there is only one Pegasus XL mission on Orbital's manifest today: the April 2013 launch of NASA's Interface Region Imaging Spectrograph space telescope. "I don't think that's our primary motivation, to make work for people," Beneski said in a Nov. 28 phone interview. "Stratolaunch asked us to come up with some concepts, and air launch is something that Orbital has always been known for." Stratolaunch is backed by billionaire philanthropist and Microsoft co-founder Paul Allen and boasts a roster heavy with former NASA personnel. The company was introduced to the public in December 2011 at a press event in Seattle, where Allen's philanthropic organization Vulcan Inc. is headquartered. Stratolaunch plans to build an enormous air-launch system that, in its original configuration with a SpaceX rocket, was to be capable of lofting 6,100 kilograms to low Earth orbit or 2,300 kilograms to geosynchronous orbit. Scaled Composites, Mojave, Calif., was tapped to build the system's twin-boom mothership: a massive, 222,000-kilogram airplane with a 117-meter wingspan capable of flying 2,400 kilometers from a launch site before deploying a rocket. Dynetics Corp. of Huntsville, Ala., is building the mating and integration system that will secure the rocket to its carrier aircraft. As first reported by Flightglobal.com Nov. 27, the main reason Stratolaunch and SpaceX parted ways was because SpaceX, decided it did not want to disrupt its Hawthorne, Calif., assembly line to accommodate the design changes required to turn its nine-engine, liquid-fueled Falcon 9 into a four- or five-engine air-launched booster. "We agreed with SpaceX that to meet our design requirements, the existing Falcon 9 architecture would require significant structural modifications to incorporate a fin/chine and to be carried horizontally," Wentz said. "As we studied the design, it became apparent that SpaceX would have to make significant modifications to their manufacturing process to accommodate our configuration, which would have a pronounced effect on their business model." A chine is an extension that joins a wing's leading edge to a craft's fuselage. Chines help generate lift at supersonic speeds. SpaceX spokeswoman Katherine Nelson, reached by email Nov. 27, declined to comment for this story. SpaceX Chief Executive Officer Elon Musk told the Royal Aeronautical Society in mid-November that "there's likely to be some changes in [the Stratolaunch] program" but declined further comment. Wentz said that SpaceX and Stratolaunch are still closing out SpaceX's contract, which the company signed last year. He would not disclose the financial terms of the deal. When Stratolaunch debuted, Allen, who also bankrolled the historic 2004 flight of SpaceShipOne, said he expected to spend "at least an order of magnitude more" on Stratolaunch than he spent on SpaceShipOne. SpaceShipOne, a suborbital spaceplane designed by famed aeronautical engineer Burt Rutan, won the $10 million X Prize in 2004 by staging two privately operated flights to an altitude of 100 kilometers within a two-week period. Developing SpaceShipOne cost about $28 million, Allen has said.